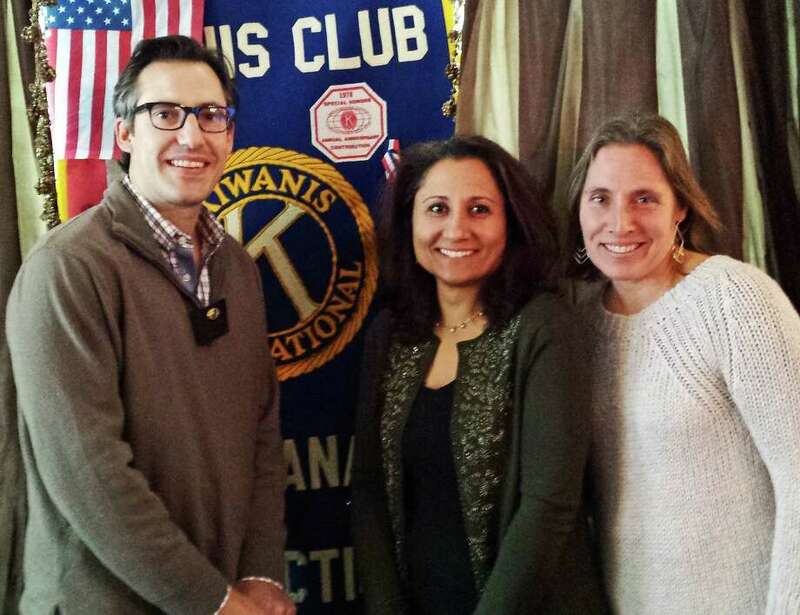 Doug Stewart, from left, Shekaiba Wakili-Bennett and Ann Wronski at a recent New Canaan Kiwanis luncheon at the Roger Sherman Inn. New Canaan Kiwanis recently hosted New Canaan resident Shekaiba Wakili-Bennett, a documentary photographer, who presented a version of the “Islam 101” talk she often gives to U.S. high school students to expand understanding of Islam. The presentation spotlighted the history of Islam, its similarities to Judeo-Christian religions, and the importance of working together to promote peace. Bennett received a Bachelor of Arts in Visual Arts from State University of New York, College at Old Westbury, and a Master of Arts in Education from Teachers College Columbia University. She holds a Permanent Teacher’s Certification in Art Education K-12th grades. Bennett has taught in high schools in New York City, Long Island, and has been a guest lecturer at numerous colleges and universities. She is an exhibited photographer, whose work has appeared in the American Museum of Natural History, Tribes Gallery, The Cathedral of Saint John the Divine, Gruss Center for Visual Arts, Gallery Arts India and Graphic Eye Gallery. Bennett’s work has also been featured in The New York Times, Newsday, NY ARTS, PBS, Town & Country Magazine, and several books. She is the co-chair of the United Nations Committee of New Canaan, a non-profit humanitarian organization and a coordinator for the New Canaan International Ladies Group. To learn more about the U.N. Committee of New Canaan, visit http://www.uncommitteeofnc.org.